On June 28, 2011, the “King of the Blues” B.B. 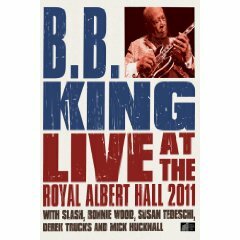 King played to an adoring sold-out crowd at London’s spectacular Royal Albert Hall. It was another unforgettable night in the career of one of the most legendary bluesmen to ever pick up a guitar. Joining the illustrious Mr. King onstage were guitar virtuoso Derek Trucks, “songbird extraordinaire” Susan Tedeschi, The Rolling Stones’ Ronnie Wood, Simply Red’s Mick Hucknall and former Guns N’ Roses axeman Slash.